Daycare is going to the dogs in Columbus! Jody Carrico knows how it feels to come home to a dog who has begun to make a meal of her furniture. As a working woman, she also understands the emotions involved in having to leave her dog home when duty calls at the office. What does one do when the options begin to dwindle? Do you crate the dog all day while at work and then try to squeeze in training and socialization? Do you hire a pet sitter to come in once a day? Or do you take advantage of Jody's resourcefulness in filling a need in the Columbus area, Doggie Daycare! 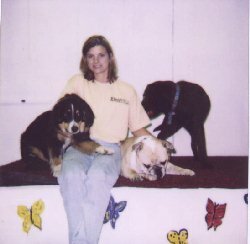 Jody spent many months researching other daycares in the country, flew to California to visit several, and called on her own personal experience with dogs in order to offer all the services her daycare could. Her ideas and plans for the center are coming to fruition. After only 30 days in business,Doggie Daycare has 20 dogs enrolled. Many are part-time, but it will not be long before there is a waiting list. Along with supervised care and daily walks, there are toys and agility ramps, and of course, lots of playtime with other dogs. Jody will offer grooming (beginning in August), obedience (puppy kindergarten will begin June 18), and a store (to include items such as food, snacks, canine novelties). She plans to begin reconstruction on the back room of the daycares' building in order to accommodate more dogs and greater play space. Prices are reasonable at $15.00 per day for 1-2 days a week and $12.00 a day for 3-5 days a week. Jody a call and see just how much easier your life will be with Doggy Daycare! Jody and a few of her clients.